I'm teaching "Electronics for Scientists" this semester, and I wanted to allow each student to have their own Arduino to play with for microcontroller lab exercises and possibly use for their final projects. The Arduino is not very expensive at roughly $30 per, but they add up quickly when you have a whole class of students needing one each. I'd been buying enough electronics equipment over the course of the semester that my department chair was showing an involuntary tic any time I knocked on his office door... So I built my own. They are a stripped-down variant of the Duemilanove. Standard Arduino form-factor and mount-points. Single-sided board, easy to make with toner-transfer method. Screw-terminal power-in connector, rather than barrel jack. Lacks on-board USB-Serial conversion, so programming requires an FTDI cable. 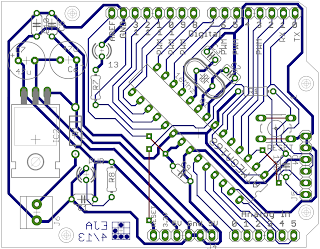 This is as detailed a board as I ever want to make using toner-transfer. Three component-side jumpers. Couldn't quite get all traces on the back side! None of these down-sides are significant for this application. The requirement of FTDI cable is inconvenient, sometimes, but I have 3-4 of them in the lab and students share them without too much squabbling. My grader, Lena, did most of the drilling and soldering work. She's graduating next week, and I'll miss her, but the graduate program in Nuclear Engineering at University of New Mexico is going to be thrilled. Note: the Arduino design, on which this is based, is licensed under the Creative Commons Attribution-ShareAlike 2.5 license; so this is available under that same license as well. 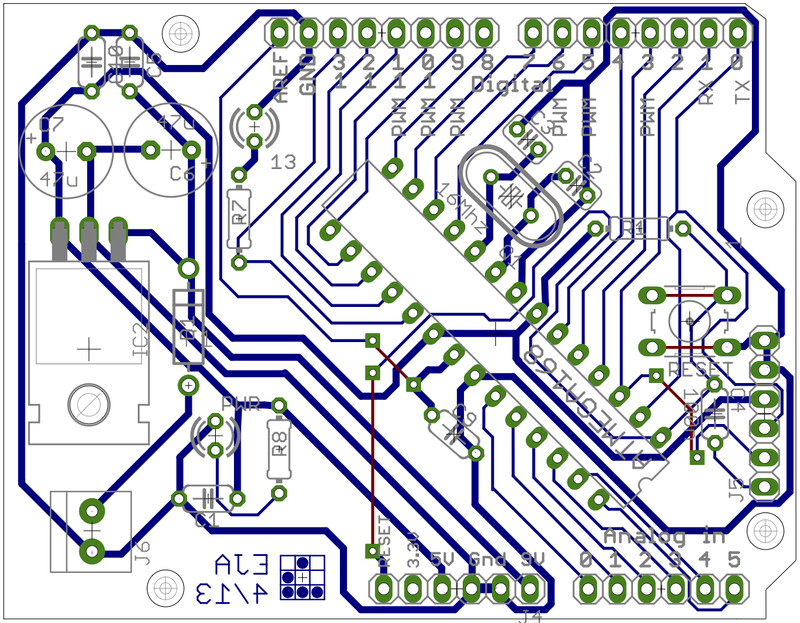 Single-sided PC board, 0.032" 1/2oz Cu. You can cut 11 of these from one 8x10 sheet of PC board if you do it just right.